Do people ever really win sweepstakes? Seriously, do they? I - Tom Barker - get asked this question on a daily basis. I can definitively say the answer is - YES. There are REAL winners just like you out there! For starters, search “Sweepstakes winner photos”, “Sweepstakes winner testimonials”, or visit your favorite sweepstakes site and look for their winner’s list. If you can’t find testimonials from a specific sweepstakes company, email them. Ask them for a copy. And they WILL email it to you. But you might think the people and their photos are fake. If you don’t see any notes about either of those things, then it’s a real photo! What Have People Actually Won? I’ve seen people win lump sum cash sweepstakes. Kitchen appliances sweepstakes. Home makeover sweepstakes. Electronics sweepstakes. And even gift cards. I, myself, have won a few things here and there. Nothing huge yet (Disclaimer: I cannot win any prize hosted by SweepstakesAlerts). But I have won a few pet items, a few t-shirts, and a book or two! I know sometimes it’s hard to sift through all the information out there and find stories about REAL winners, so I’ve put some together here for you! Remember, this could easily be you in the future! James A. Langham of San Antonio, TX became the winner of $2,500 cash by entering only once in PrizeGrab’s “Refer-A-Friend” sweepstakes. This was his first win ever, and boy did he look happy! 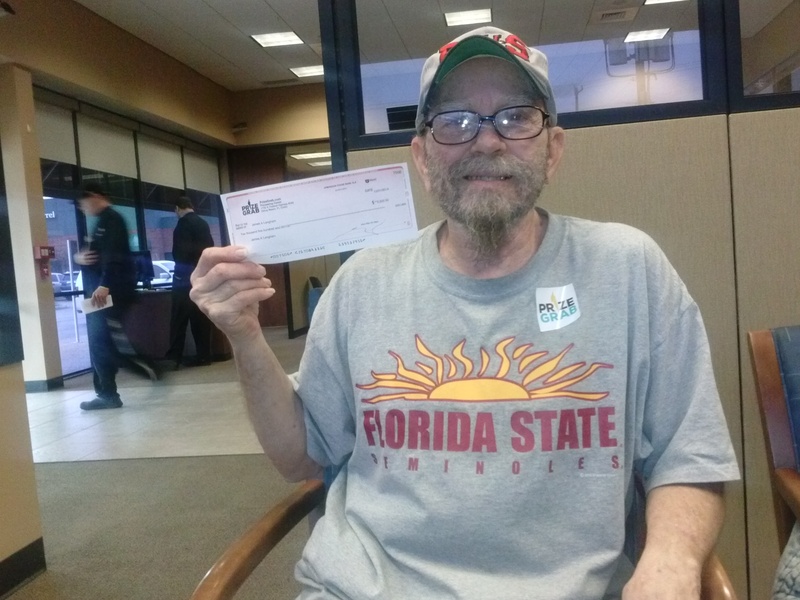 He took his check to the bank to cash it and just had to share the news with all of the people in the bank! So, that’s what he did. PrizeGrab goes on to talk about how you can’t win if you don’t enter, and that’s true! If you don’t enter, there’s no way you’ll be chosen. I can say from my experience working with SweepstakesAlerts that PrizeGrab is one of those sites that sticks true to their word. They really do have daily winners, and it’s the only site I’ve been to that offers everything from daily gift card giveaways to thousands of dollars in cash! I can’t tell you how nice it is to have some many giveaways listed in one place. If you don’t want to spend a ton of time entering, at least throw an entry or two in there from time to time until the sweepstakes ends. That gives you a chance to win! I mean, look at James here; one entry and his life changed for the better. How much would $2,500 help you today? I know it would help me a lot with remodeling my kitchen and replacing those cabinets I dislike so much! Dan Cavanaugh of Scottsdale, AZ received a giant surprise when he was named the winner of a 2015 Acura TLX, $50,000 cash, and an Urban Oasis home. The total package was worth more than $1.5 million dollars! 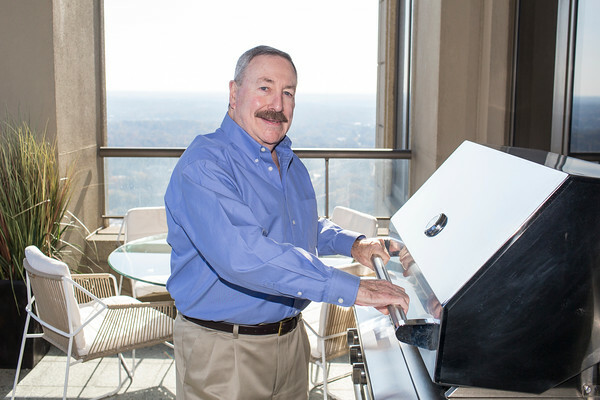 There were more than 22 million entries in the Urban Oasis sweepstakes so Dan said he was pretty stunned to be named the winner. “I guess you never expect to win,” he says. “When I got the call from HGTV, I thought my friends were joking with me and didn’t call back right away. I couldn’t believe that I’d won”. I, myself, entered the HGTV sweepstakes (as I do every year) in the hopes that I won’t have to finish the remodel, because I’ll win this fabulous million dollar house that’s ready for my family! You know, maybe a nice little place on the beach or something. BUT, I’m always happy to hear that someone has won. It’s nice to know that there are really winners on HGTV! A PrizeGrab Believer Who Became A 2x Winner! Robert Thomas of of South Bend, IN proves that luck lightning can strike more than once for a sweepstakes enthusiast! 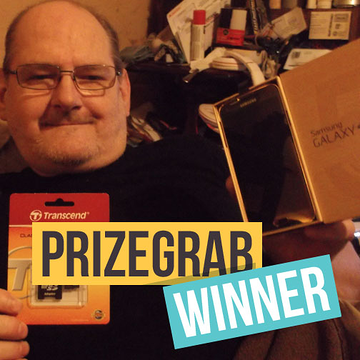 Robert won a $10 Amazon gift card first but then was told he’d also won a Samsung Galaxy S5 worth more than $700 (at the time)! He didn’t win on just a one-off entry, though. He proved that it can sometimes take tenacity to win big by entering for 377 days out of his 478 days of membership before winning. Now Robert has been keeping his eye on the Refer-A-Friend PrizeGrab $2,500 prize by referring all of his friends for entries. I looked him up on Facebook and saw that he’d been posting and letting people know he’d won before and they should enter, too! Lavonia Brown, a self-proclaimed savings expert among her friends, was named the winner of $10,000 from Eversave to renovate and make payments on her home. After two years of being a faithful daily member at Eversave, Lavonia was completely stunned to win the sweepstakes since she’d completely FORGOTTEN she entered! So as you can see, real people, just like you, win sweepstakes every single day. All it takes is entering and positivity. And I would love to see you win as well. If you do end up winning, always be sure to shoot me an email and let me know what you won! I’d love to include you in this list and continue to prove all the naysayers wrong! Be sure to check out our other articles about how to increase the odds in your favor to learn how to win sweepstakes!